Member of the “Gambrinus Stein (Collecting) Club” of Virginia, Maryland and DC, and also of SCI. 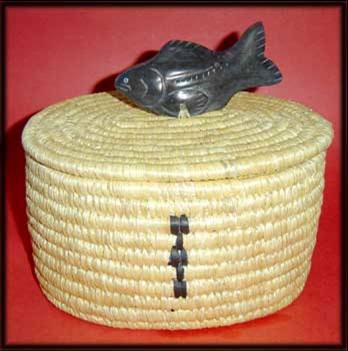 Basketry is the weaving of unspun vegetable fibers, usually to form a container. Baskets have been made from any wood, vine, leaf, or fiber that could be formed into a desirable shape. Our ancestors, no matter who or where they were, made baskets. In every civilization and every part of the world, basket making has been practiced. Needed as carrying vessels, baskets were probably eventually replaced by clay pots, which were often more durable. Baskets are so prevalent around us, that we take them for granted, but they were the paper bags and cardboard boxes of their time. There are generally five types of basketry. “Coiled” basketry tends to use grasses and rushes. “Plaiting” uses materials that are wide and ribbon-like, such as palms or yucca. “Twining” uses materials from roots and tree bark. “Wicker” and “Splint” baskets use reed, cane, willow, oak and ash. I am a basket weaver of the Appalachian style baskets which feature primarily the splint and twined baskets so I am always looking for the basket form and materials when antiquing or ‘checking out the shops’. When I was at the Bavarian National Museum in Munich many years ago, I saw two beer steins made of coiled basketry—which is much more the style of the Native American peoples of the Alaskan Inuit Islands like this newer basket seen here. My husband, John Stuart, now deceased, was the stein collector in our house at the time, and I told him right there in the museum, “If you ever see a stein like one of these for sale, please buy it.” Well, unfortunately, I had no idea how rare such a basket stein would be or what such a piece would cost, but indeed some years later; John was able to purchase one and brought it home for me. It is a very unassuming looking stein, but it sits in a place of honor on the mantel in the living room. I enjoy looking at it daily. These basket steins were made in Tourgenau, Germany, up until about the first quarter of the 18th century. If the baskets (whether steins or carrying vessels) were well used, wherever they were carried or touched often, the material would tend to abrade and eventually break causing the basket to eventually unravel, rendering it useless. That is why there are so few really old baskets or basket steins today. The one from my collection is seen here. An interesting fact about the age-old craft of basket making is that, while many other crafts have become mechanized, no one has ever invented a machine that can make baskets. They are still handmade, even in Taiwan. It’s not even an easy task to mass-produce baskets with the aid of molds, electric saws and sanders, and a multitude of “assembly line” processes. In fact, no one has ever improved upon the earliest and most basic techniques of basket making. Coiling style, which this basket is, is a technique of winding up the vegetable fiber like a snake while stitching it every inch or oftener to the row before it. The inner coil (core) material is usually grasses or a fairly pliable vegetable fiber. The wrapping and sewing material which covers the core material, holds the basket together and helps to shape it is a stronger fiber from trees, usually. While that is what coiling is, this basket, while coiled, is made from European willow, which is not like our willow tree, but more of a woody plant that can be harvested and re-grown the next season. The inner portion of the woody stem is somewhat stiff and can be cut (after boiling to make it supple) and formed into the core or center for the coiling process. The inner core could also be made of grapevines which are abundant in parts of Germany, too. The exterior of this stein I believe to be the ‘bark’ or outer covering of the willow stem that has been stripped from the stem after the boiling and cut into fairly even strips that are used to wrap and then‘sew’ the cores one on top of the other, thus building the columnar shape of the stein. 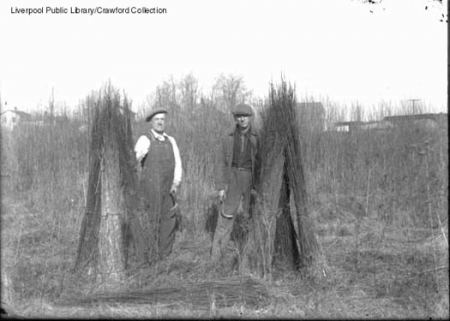 I have included a photo from the Liverpool Willow Museum that I got from their website which shows the harvesting of Eurasian willow in bundles and what it looks like when it is growing. 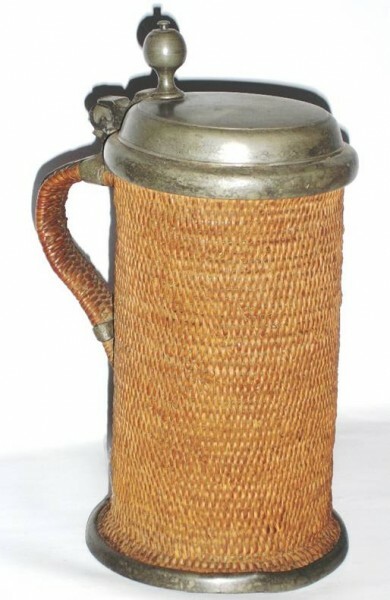 The handle of the stein from my collection has extra of both core and wrapping incorporated into the body to make it a usable part of the stein. It also has an outer pewter strap that is attached to the neck ring and the foot ring to help give strength to the handle. This basket was probably made about 1710 and when held up to the light and looked through the inside of it, there are only two pinholes of light that can be seen. So after 300 years, this natural material is still virtually water-tight or beer-tight as the case may be. The outside of the bottom does have some pitch or resin on it which was probably used to stop a small leak at some point in the past. And now for the rarity—I am not sure how rare it truly is, but I know that Judy and/or John Stuart have been avidly collecting steins for over 30 years in this country and in Germany. In that time, I have seen 6 and of those only 2 were for sale, and one of those was unraveling. So I think it is a rather scarce commodity.